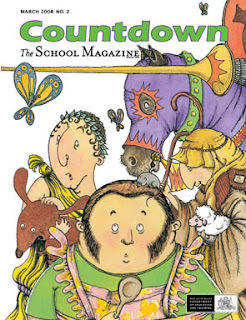 The School Magazine, at 95, is the world's oldest literary magazine for children and is published by a small, dedicated and skilled staff who are part of the NSW Department of Education and Training. There are four separate titles for a total of 160,000 readers across Australia each month, for 10 issues a year. Children, teachers, librarians, parents, authors/illustrators enjoy the range of stories, poems, plays, articles, comic series and activities in the 36 full-colour pages of each of the 40 magazines each year. Subscriptions are as strong for 2011 as ever. The School Magazine now faces the threat of cutbacks. Because the magazine’s publishing unit is being merged with another within the department, all staff of both units will cease at the end of January 2011. Positions in the new unit many be offered to some permanent staff, but not to most of the staff. This means the quality of the Magazine will suffer. If quality and quantity suffer, so will subscriptions. Eventually, this fine resource of writing for children in New South Wales’s schools – and, of course, for the many children in other Australian states who subscribe – will disappear. The School Magazine publication with its wonderful resource of storytelling is the envy of the other states, because no other State Government offers it. Write to the NSW Minister: Please use this SAMPLE LETTER. It’s in PDF so you will need to save as text and add your NAME and ADDRESS before you email it. Then email it to the Education Minister, Hon. Verity Firth MP: office@firth.minister.nsw.gov.au, or post to the above address – NOTE: written letters are more effective. Read more about The School Magazine here. The School Magazine is worth supporting - governments for the past 95 years have thought so, why is it being put at risk now? Please take a few minutes to add your voice in this bid to save a great little set of magazines for young Australians in the future.